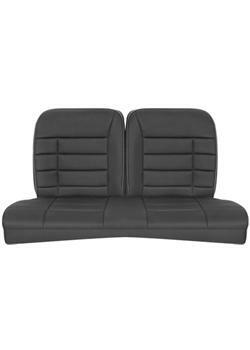 Corbeau Seat Covers - Mustang Rear Seat Cover FORD - Pann Auto Performance - San Diego largest aftermarket automotive performance parts - What do you drive? Corbeau Mustang covers are designed to replace the factory Fox Body rear seat cover and without a doubt will improve the interior look of your Mustang. These can be used to replace your worn out stock cover or for an exact match to your Corbeau front seats. Covers are available for the Coupe (79-93), the Hatch Back (84-93), and the Convertible (83-93) and can be ordered in Black Cloth, Black Vinyl, Grey Cloth, or Black Microsuede. Please note the pictures shown are of the Hatch Back model.